The Gypsy Tea Room is worth a visit if only to see the classic neon sign in front. The different colors on this marquee neon really add to the sight. H3 Ranch is just one of the many steak houses in the Texas area. This one sports a horseshoe shaped marquee out front and advertises its steaks and rainbow trout. Here's an old classic roadside restaurant. Elmer's Restaurant appeared to be located right in the middle of blaring radios at car dealerships that were blaring music to would be buyers. Otherwise, Elmer's appears to be a great reminder to the 50's or 60's restaurants that used to dot the area. 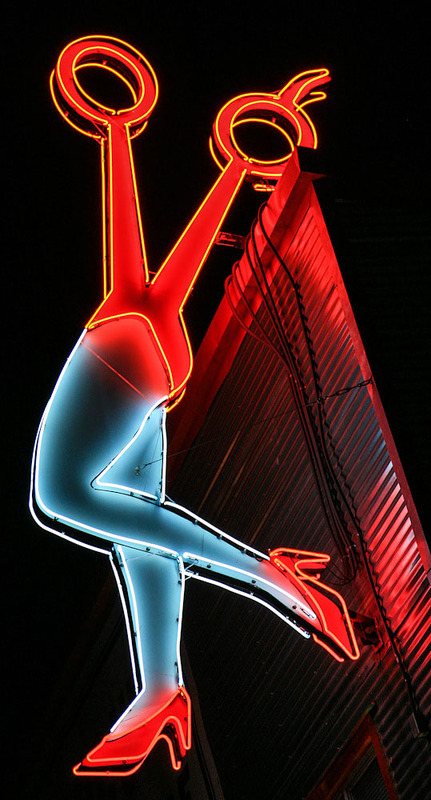 The Frisco Nighthawk Restaurant and it's good lookin' neon is rumored to have been a favorite of LBJ's. Not sure what Ladybird Johnson thought of the sign though. The sign is unique in that in one view, it looks like a sack containing an oversized burger or sandwich. However, in another view, the distinct look of the "night hawk" can not be missed. The Bella Napoli Restaurant in El Paso advertises its cuisine off the roadside. Just search for the big V marquee to find the Bella Napoli. Not sure how old this sign really is though. Also in El Paso is the Charcoaler "drive-in" Restaurant, featuring charcoal burgers. This marquee looks like it belongs off an old roadside. This neon sign for Sonny Bryan's Smokehouse advertises this barbecue joint that appears to have been in business since 1910. 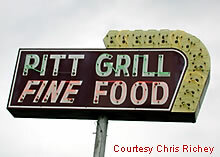 The Pitt Grill in Buffalo, TX advertises its fine food on its fine sign.